Authority: Rabbi Menachem Meir Weissmandel, Nitra, Monsey, NY, U.S.A. Comment: The hechsher of Rabbi M.M. 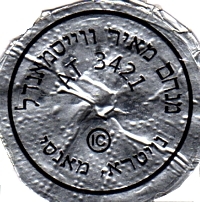 Weissmandel on the capsule is accompanied by hechshers of the Orthodox Union [front label] and Rabbi G.M. Garelik, Milan [rear label].